It isn't quite as bad as it looks as the council is saying that it intends to keep the main routes clear – but it is encouraging "self-help" to deal with the minor routes. Personally, I think people should as a matter of course clear the footpaths in front of their own properties, and especially commercial properties. In many countries this is either a tradition or required by law. 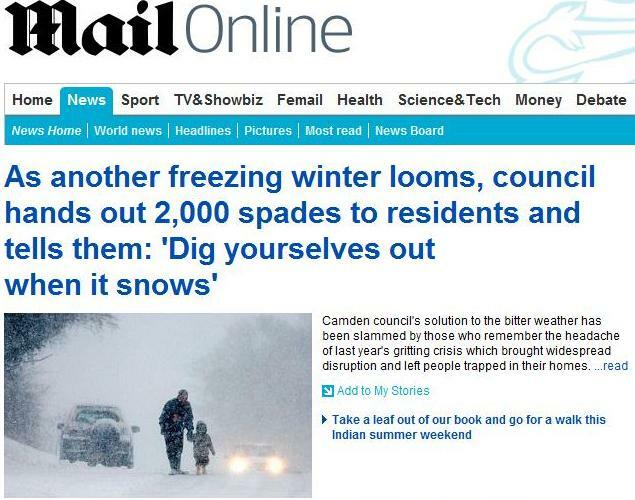 We should not as a rule expect local authorities to be clearing snow on their own. But what is especially interesting about this piece is the uncontested assumption that an "Arctic winter looms". 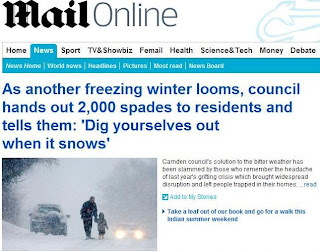 The paper could be wrong, of course, but taking this line suggests that it is getting a strong line of information which gives the idea some plausibility – even if more snow is simply another sign of global warming. "The growing toxicity of their attitude"
What will the warmists do? Splattergate: "too urgent not to use it"
Splattergate – the new Climategate?